PBS producer Rick Sebak wrote to say that the premier of the new HBO series Boardwalk Empire, about the arrival of Prohibition and the growth of organized crime, featured a Lincoln Highway sign. 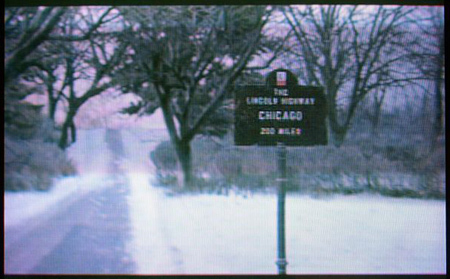 Young Al Capone was driving a load of stolen liquor to Chicago when the sign went by: “LINCOLN HIGHWAY” with “Chicago 200 Miles” just under that. It was square in shape, navy blue in color, probably metal on a roadside pole. When the show rebroadcast, Rick took a photo of his TV screen for us! 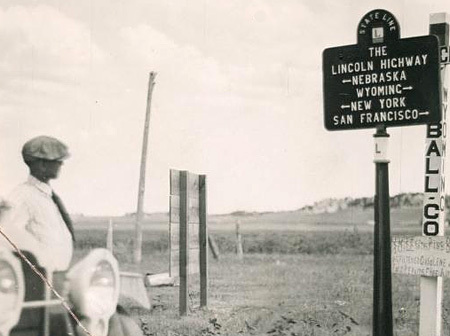 LH fans will recognize that the sign is pure fiction but is based on real-life state-line markers produced in 1917, such as this one from the LHA archives showing the border of Nebraska and Wyoming.